(WILLIAMSBURG, VIRGINIA) Today, Velocity Urgent Care (http://velocityuc.spinmodern.co) announced the opening of its newest walk-in medical center in Suffolk, Virginia. The new location will open its doors on Monday, June 4, 2018, at 1001 Centerbrooke Lane, at Godwin Boulevard, just North of Highway 58. 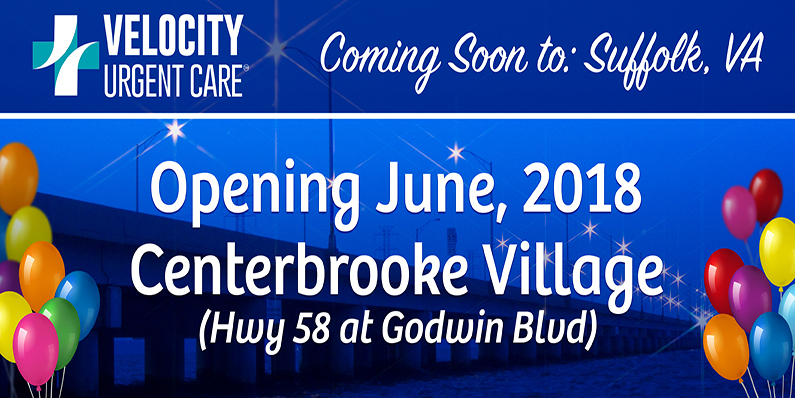 This announcement marks the second opening of a new urgent care center location this summer for Velocity, with upcoming Hampton Roads sites under construction in Norfolk (Wards Corner) and at Hickman Place in the Red Mill/Nimmo Parkway area of Virginia Beach. Velocity Urgent Care centers are staffed with friendly providers and staff, and offer no-appointment-necessary visits for minor illnesses and injuries. The right time to visit urgent care is when your condition cannot wait for a primary care appointment, but is not severe enough to warrant an emergency room visit. Velocity Urgent Care centers treat cold and flu symptoms, coughs and congestion, seasonal allergies, earaches, headaches, sprains, strains, fractures, minor cuts, scrapes, and rashes. They are also able to perform on-site x-rays and common lab tests. Consumers will be pleased to know that most insurance is accepted, but there is a “no surprises” self-pay option as well. For residents and visitors to the Suffolk area, the opening of this new center provides convenient and close to home access to exceptional care and money-saving value. Recent surveys show that upwards of 80% of emergency room visits could have been avoided for non-severe, non-life-threatening problems easily treated by urgent care. Urgent care centers offer much shorter wait times and much lower costs compared to emergency rooms. Having a convenient urgent care location close to home will give Suffolk residents a chance to avoid unnecessary emergency room visits for minor illnesses and injuries and keep more money in their pockets. “We look forward to saving Suffolk residents money on costly emergency room visits while providing top-notch care,” Ayers added. “Our patients are really going to appreciate the quick, cost-effective care we are bringing to the area.” The new location will be open 7-days-a-week from 8:00am-8:00pm Monday through Friday, and from 8:00am-4:00pm on weekends. Velocity Urgent Care currently has 10 locations across Virginia including Williamsburg, Virginia Beach (3), Carrollton, Gloucester, Newport News, Norfolk, South Boston, and Suffolk, with additional locations opening in 2018. Each center provides high-quality, walk-in medical services for illness or injury that cannot wait for a primary care appointment but not severe enough to warrant an emergency room visit. Licensed medical providers treat the flu, strep throat, rashes, dehydration, ear infections, concussions, sprains, strains, minor fractures and more. For more information, visit http://velocityuc.spinmodern.co.